DETROIT — Northern Illinois is hoping to re-establish its recent run of Mid-American Conference dominance with a return to the Motor City in November. For Ohio, the championship history is more in the distant past. The two teams are the divisional favorites in the media’s preseason poll released Tuesday, when the MAC held its media day at Ford Field in Detroit. The stadium is also the site of the Nov. 30 conference championship game. Northern Illinois made the MAC title game for six straight seasons from 2010-15, winning it three times in that span. Ohio hasn’t won a MAC title since 1968. 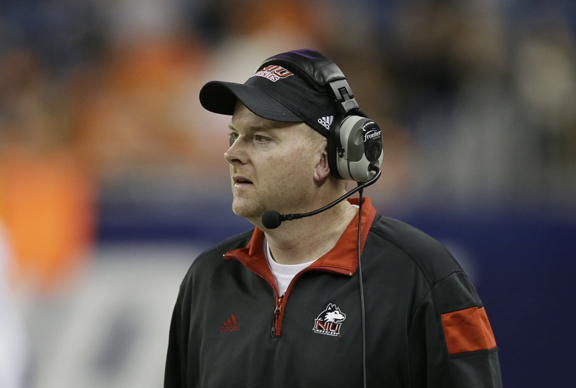 Although the conference is known for midweek offensive fireworks, Northern Illinois coach Rod Carey said defense is the key to getting back to Detroit, where Toledo topped Akron 45-28 for last season’s championship. NIU will be led by defensive end Sutton Smith, a second-team All-American who led the nation with 29.5 tackles for loss and had 16 sacks. Carey said he’s been pleased with the work ethic of Smith, who said he added 20 pounds of muscle this offseason. Under coach Frank Solich, Ohio led the MAC with 37.4 points per game last season. Returning at quarterback is Nathan Rourke, a Canadian who rushed for 21 touchdowns last season in his first year as a starter. In the East Division, Ohio received 21 first-place votes and 140 total points from the 24 media voters; Buffalo was second (one first-place vote, 112 total); Miami was third (two, 95); Akron was fourth (74); Bowling Green was fifth (58); and Kent State finished sixth (25). In the West, Northern Illinois earned 15 first-place votes and 133 total points; Toledo was second (seven, 125); Western Michigan was third (one, 87); Eastern Michigan was fourth (67); Central Michigan was fifth (one, 58); and Ball State was sixth (34).